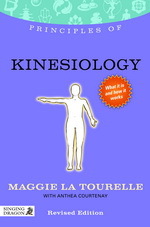 Principles of Kinesiology by Maggie la Tourelle with Anthea Courtney, Jessica Kingsley Publishers, 2013. Principles of Kinesiology continues to be the classic introductory kinesiology book worldwide and has been translated into German, Italian, Spanish and Portuguese. This was the first introductory book to cover the field of kinesiology, written for people who have no knowledge of kinesiology and for kinesiologists interested in branches other than their own.